You say ‘Boo’, I say ‘Bo’, whichever way you say it, a restaurant review is a subjective matter. Having read various mixed reviews on Chef Alvin Leong’s BO Innovations, I managed to convince Mom to test out the maverick chef’s self-proclaimed ‘X-treme Chinese cuisine’ on her Lunar birthday. The Chinese is a lucky race to have 2 birthdays – a Lunar and a Gregorian – so if you miss one, you can easily make up with another! 😜 (We celebrated Mom’s Gregorian birthday here). 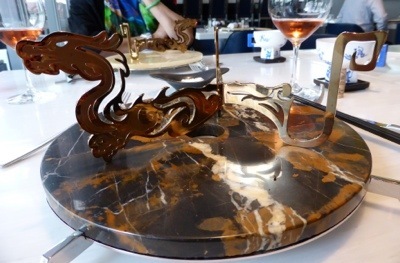 What Alvin terms ‘X-treme Chinese cuisine’ is essentially combining traditional Chinese recipes with scientific molecular gastronomy techniques – in what I call ‘Thermomix magic’, a nifty and super-expensive all-in-one kitchen appliance. Naturally, in order to understand whether Alvin had accomplished what he set out to do in his ‘X-treme Chinese Cuisine’, one should already have a background in traditional Chinese cuisine. In my opinion, who else makes a better judge than Mom who has intrinsic knowledge of Chinese cuisine to be able to discern the subtleties of traditional Chinese cooking under the guise of modern molecular cooking – and explain them to me? A little bit on Alvin: He is the controversial self-promoter who prided himself the ‘demon chef’ or 厨魔, tattooed in Chinese characters on his forearm. An acoustic engineer by training, he ditched engineering to become the second self-taught chef in the world – after Heston Blumenthal – to be awarded a Michelin star. Likewise, Bo Innovation’s Chinese name, 厨魔, literally means ‘kitchen demon’. 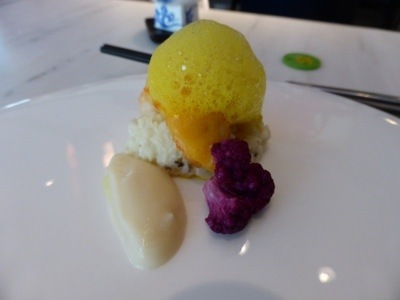 It has won many restaurant accolades, having remarkably debuted with 2 Michelin stars in the inaugural Michelin Hong Kong & Macau Guide in 2009, since then it had lost 1 star then bounced back to regain 2 stars in 2012 and 2013. This year, it is hanging onto No 15 in the Asia’s 50 Best Restaurants 2013 and No 90 in the World’s 100 Best Restaurants 2013. 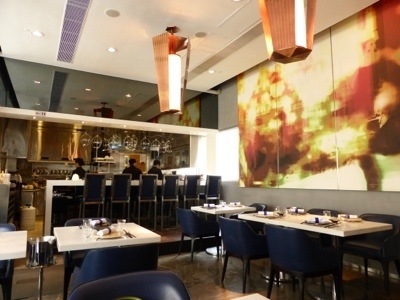 The restaurant is located on the second floor of a semi-residential building – J Residence in Wan Chai, which is fast filling up with trendy restaurants. Access is via a dedicated elevator accessed from Ship Street which opens up directly to the patio. 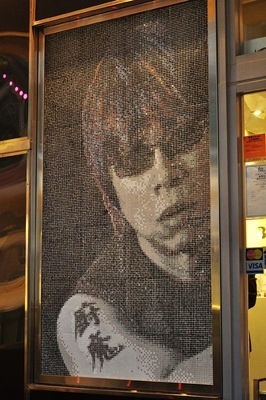 Guests are greeted by a giant black-and-white mosaic portrait of Leung pontificating in his dark shades. The compact dining room seats around 60 people with an additional outdoor patio seating. The interior is very sleek – black reflective surfaces, glossy white table-tops and shiny copper hexagonal lightings overhead with a large screen print of a blurred neon lights of Wan Chai to add a splash of colour. For the inquisitive guests, there is an open kitchen/ bar to check out the action. (Unfortunately, on the day of our visit, Alvin was not around. We assumed him to be in London, for his much-hyped new restaurant opening). A screen print of a blurred neon lights of Wan Chai. 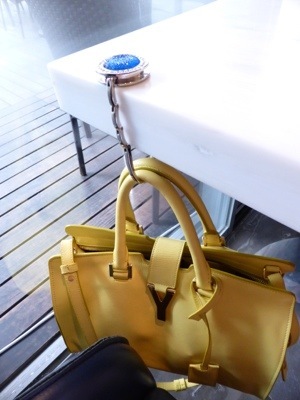 Bag hangar for my bag! 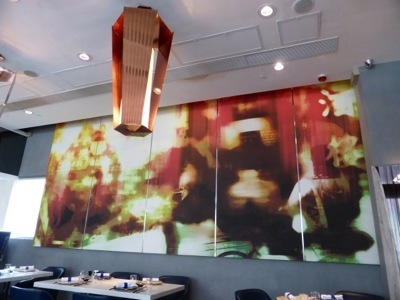 There is a choice offor a Set Lunch or a Degustation at HK$780 (+10%). We chose the Degustation. We ordered a half-bottle of Pink Kiss Wein from Willi Opitz which came in a gorgeous black bottle with a giant red lipsticked label. 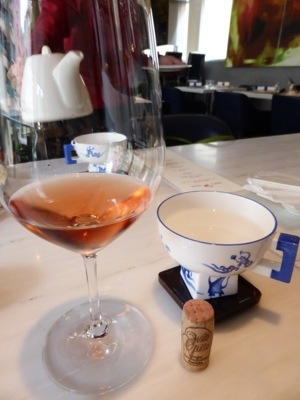 We thoroughly enjoyed this pink Austrian rosé, and thought we did well in picking this wine as it paired marvellously with the food we were soon eating. It had a lovely nose with haunting rosehip and strawberry fragrance and a palate brimming with lively, fresh, cranapple acidity. Service was fantastic! Ooops… I’ve said it before. The service crew was friendly and very professional. Both the waiter and waitress took turns to explain each dish clearly and bringing out samples – in the process of making us informed diners. 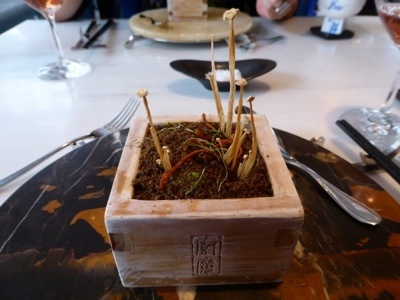 The garden/ soil theme seems to be a popular theme in gastronomy nowadays – I have came across a couple of edible garden themes this year, the most memorable is the Flower Pot at Mandarin Grill (here). 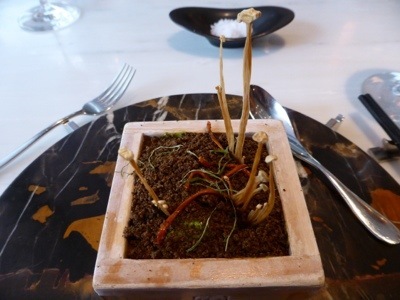 Alvin’s Dead Garden is made of dehydrated mushrooms on top of avocado-onion butter: Air dried crumbled morel mushrooms representing dirt; caterpillar fungus, a kind of fungus that is sometimes used in traditional Chinese medicine, laying like a worms on top of the soil to create a creepy surreal effect. Enoki mushrooms (‘trees’) have been deep-fried then dipped in liquid nitrogen to intensify the flavour as well as to make them shrivel and crispier. We were advised to eat the ‘trees’ first, then the ‘worms’, then mix the remaining ‘soil’ with the avo-onion butter ‘earth’ before eating. 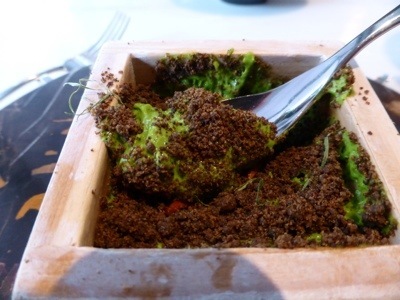 I must say, the smooth creamy avocado and green onion mousse was the perfect accompaniment to the crunchy morel crumbs, sweet with a slightly acidic kick, the Dead Garden thus set scene for a truly memorable meal to come. 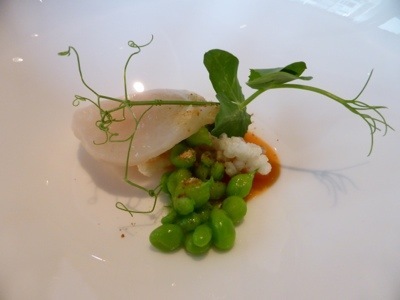 A beautifully presented moreish (aka small) dish of barely seared Hokkaido scallops – nice, firm and very flavourful – served with crispy woba (or crispy burnt rice which were leftover in rice pots in olden days before the invention of rice-cookers) and snappy sweet sugar peas. The dish was drizzled in the ‘jolo’ sauce (fermented red rice vinegar) which has a sour taste albeit spicy kick! 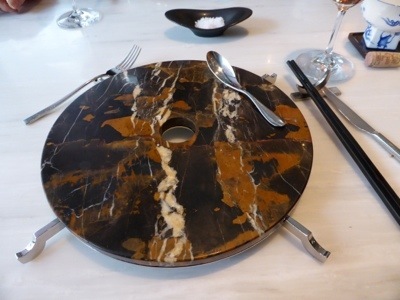 Chipped bowl in a Michelin Restaurant?? 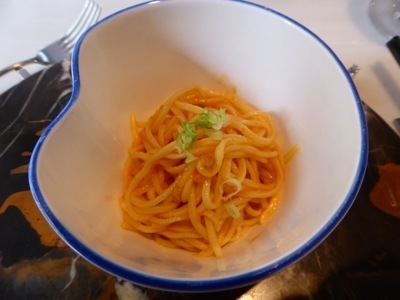 This course is ‘lo mein’ tossed in har mi and garnished with tiny shrimp roe (kaniko). 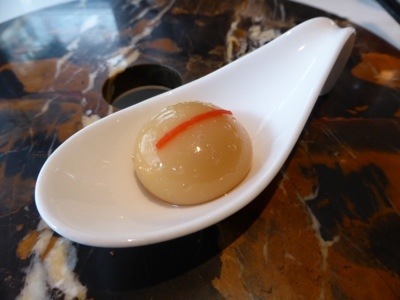 The specialness in this course lies in the har mi (dried baby shrimps) oil which Alvin concocted by infusing har mi in the oil for 3 days before distilling it. Personally, I did not find anything remarkable about this course, the noodles were so-so, not the springy ones that I remembered fondly from here. Did I mention that Alvin is artistic as well? 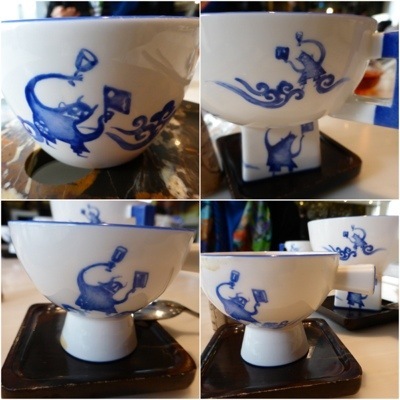 He designed these cups – and the cute caricatures of the demon with chopper! I skipped this shellfish, for a fish substitute. Beautifully plated, I am sure this is a winning combination of langoustine with English mustard and salty egg. 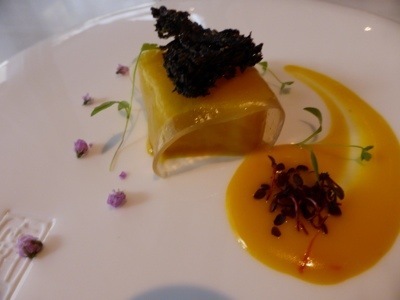 My substitute was a cod wrapped in sauternes jelly,dressed in yellow miso and seaweed. I remembered the cod being overly done, but otherwise, it was a tasty combination. I also remembered this dish well. The sous-vided beef was cooked medium-rare, a good piece of beef but nothing out-of-the-ordinary. The cheung fan was very salty being drenched in soy sauce. 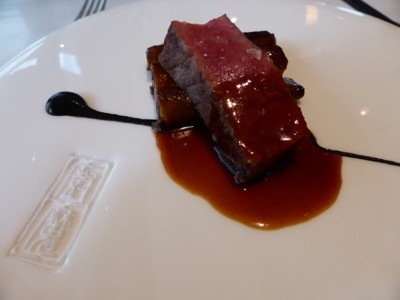 The strip of black truffle sauce only accentuated the overly saltiness of the course by leaving a strong aftertaste. 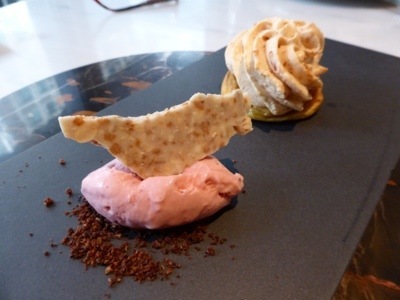 Strawberry gelato and orange profiteroles. 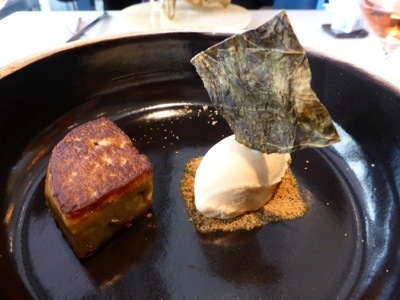 Overall, it was an enjoyable and interesting meal, but nothing overly ‘x-treme’ about it, then again, I had been to Tapas Molecular Bar in Tokyo (here). 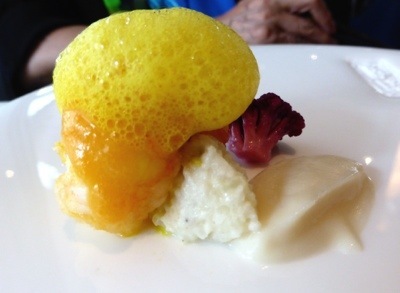 I am somehow desensitised with the hype surrounding spherification and liquid nitrogen. Taste-wise, the food at Bo Innovation all have strong tastes – in part from the use of vinegars and soy sauce – I am guessing because Alvin smokes cigars? At HK$780 (+10%) for a degustation lunch or HK$288 (+10%) for a Set Lunch, it is really up to you to call it a “Boo-” or a “Bo-” Innovation. 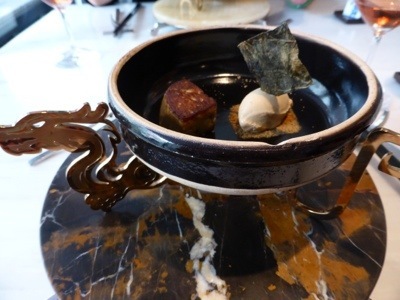 This entry was posted in Hong Kong, Michelin Restaurants, Molecular Gastronomy and tagged 'Cheung fan', Alvin Leung, black truffle, cauliflower, Chili, Chinese Fusion, Chinese Molecular Gastronomy, Cod - Sauternes jelly, crispy woba, Dead Garden, duck jus, Edible Oil, Foie gras - 'Mui Choy', Har Mi, Har Mi - 'Lo Mein', Kaniko, Langoustine - English mustard, Molecular Xiao Long Bao, Pink Kiss Wein, Saga-Gyu Beef - Black truffle, salty egg, Scallop - Shanghainese 'Jolo' sauce, Soy, Strawberry gelato and orange profiteroles., Wanchai. Bookmark the permalink. 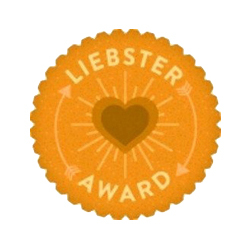 On behalf of Mom, ‘Thank you! 😘’ Ya,the noodles was quite a small serve. 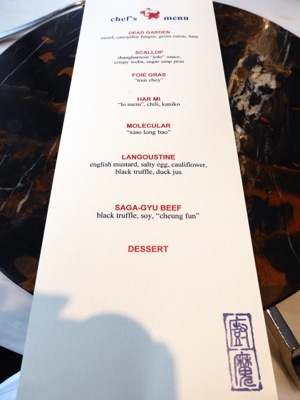 But it was a great experience – and I’ve crossed Chinese molecular off my list! Yay! Great post! I was there for dinner for my husband’s birthday about a month ago. 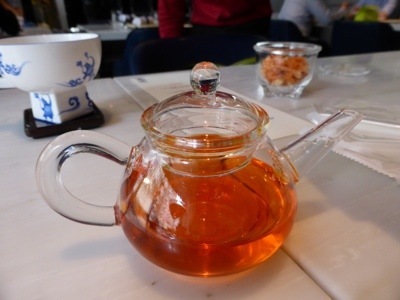 A mixed but overall positive experience, not worth the extravagant price but glad we tried it once. I may also review soon – will give you a shout out on my post, if you’re ok with a cross-reference? Cheers! Not problem! I’m happy with cross-referencing (I need to tone down my disclaimer 😛). Well, since u are in HK, u might as well give it a go, right? Looking forward to ur post!